Giant Jesus takes his pet fish for a walk. From here. Bibliothèque de Genève, Ms. fr. 1/1, f. 5r. Guyart des Moulins, Bible Historiale, c. 1400-1450. 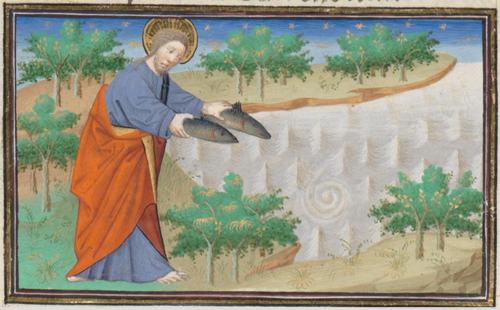 For another pair of fish, less silly, see here, f. 5r. This entry was posted in General Culture, MedievalBlog and tagged art by medievalkarl. Bookmark the permalink.